Vision Surveys boasts a management team with diverse backgrounds and respectable depth of knowledge. We are proven industry leaders in Licensed Surveying, Land Development, Town Planning, Construction, Mining, Hydrographic and Island Surveys, our team also has extensive product knowledge in both Leica and Trimble technology. Our motto “Your Vision Our Goal” is something we truly believe in. David began his career in Townsville at C&B Consultants before relocating to the United Kingdom for 4 years where he specialized in multilevel high rise building setout surveying at Canary Wharf in London’s CBD. 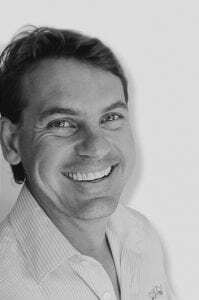 David then moved back to Brisbane with a medium size private practice in Brisbane’s eastern suburbs specialising in residential estate project management and surveying. As part of the expansion of this practice David relocated to the Whitsundays as their Office Manager. 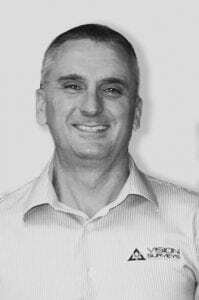 David is the founding director of Vision Surveys (QLD) and has 20 years industry experience. Brian joined Vision Surveys as Director in 2011. 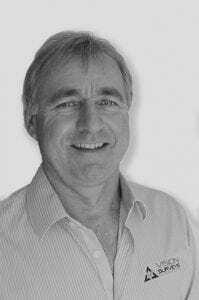 He has worked within the Surveying Industry for over 32 years, with experience in Property Development, Town Planning, Cadastral and Engineering Surveys and gained extensive knowledge in Project feasibility, Management and Coordination as well as liaising with Council and Government Agencies. Brian is CASA qualified as a Remote Pilot and is registered with CASA as Chief Remote Pilot for Vison Surveys (QLD) Pty Ltd. Domestic Surveying (house set outs, Contour and Detail Surveys. John is a Cadastral Surveyor and registered with the Surveyors Board of Queensland, with a Cadastral endorsement, since 2000. John has worked within the surveying industry for over 20 years, where he spent the first half of his career working in South-East Queensland and the second part in North Queensland. He has worked on a wide range of projects, specializing in large Community Title & Mixed-Use Developments, Urban Renewal projects, and large Infrastructure projects. Adam is a Senior Surveyor with over 12 years professional experience in cadastral, construction, and engineering surveys, including project management for residential subdivisions (standard, volumetric and building format surveys), engineering surveys, lease surveys of commercial buildings, topographic mapping, cadastral and control surveys. Adam has experience in all facets of residential estate, civil construction, detail and contour mapping, ‘As -Constructed’ surveys and the preparation of cadastral survey plans. 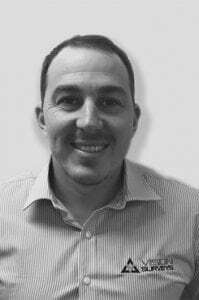 Louis is an experienced surveyor in engineering and construction surveying. He has managed both large and small-scale projects from the initial stages of tendering through to managing and overseeing each project to completion. Louis has extensive experience in leading a survey team on infrastructure projects and liaising with clients, engineers, contractors, mine supervisors, solicitors, equipment suppliers, and Government departments to ensure communications are maintained, and a successful outcome is achieved on each project. 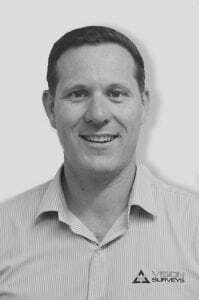 Wade is an Engineering Surveyor with an Associate endorsement from the Surveyors board of Queensland. Wade is also a Registered CASA Remote Pilot who has worked within the surveying industry for over 15 years, where he spent the first 5 years of his career working throughout Central Queensland. He has worked on a wide range of projects specializing in Mining and Gas infrastructure & general engineering surveying for large scale development. 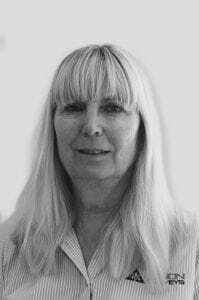 Lee is a Senior Town Planner with more than 29 years of experience in the local government and town planning industry. Lee has been the assessment manager for most development which has occurred in the Whitsunday Region since the late 1990’s. 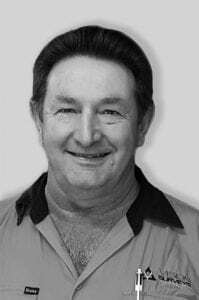 Prior to joining Vision Surveys (Qld), Lee worked for the Whitsunday Regional Council for over 27 years and held the position of Senior Town Planner for 7 years and before then becoming the Executive Manager of Council’s Planning and Development Department for 5 years. Dealing with Unlawful Uses and Non-Compliance Matters.